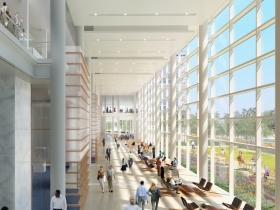 Northwestern Mutual's new office tower isn't just a skyscraper. Mary Louise Schumacher views the mockup. 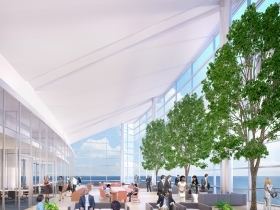 On September 25th plans for Northwestern Mutual Life’s $450 million, 32-story, 1.1 million square-foot office tower were revealed to the public. 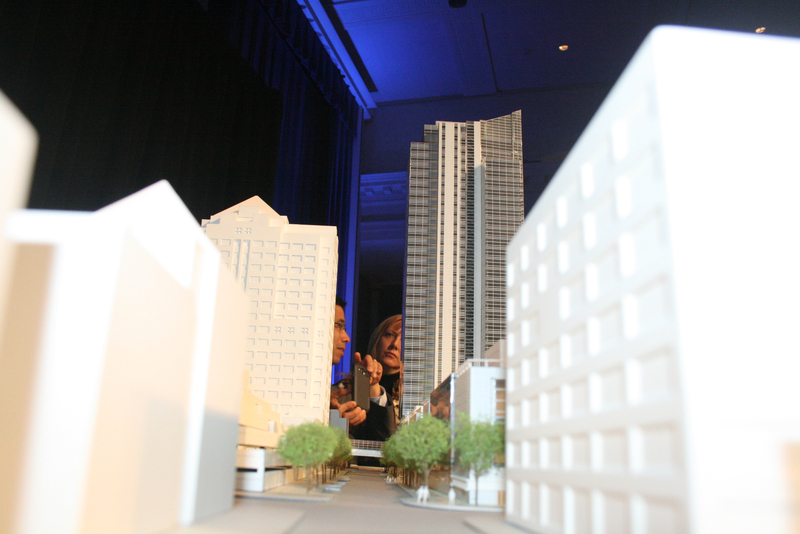 The focus of the public and the excitement in the room that day revolved around the design of the new skyscraper. 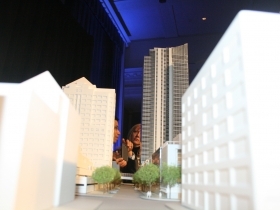 Would it be that “iconic” structure that John Schlifske, CEO of NML, had promised? But the glassy skyscraper designed by Jon Pickard, of Pickard Chilton, reflected NML’s former “Quiet Company” mantra by projecting stability, grace, even elegance, not the brashness and attention some skyscrapers long for. 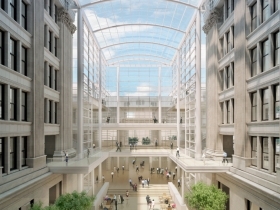 Overlooked in the discussion of the project’s design are the parts that actually impact daily life of Milwaukeeans: the common area, publicly accessible portions of the building, and prominently the “inviting” plaza described by Pickard. If this video by Building Wisconsin is any indication it looks like the Menominee Tribe has the support of the construction unions, which seems reasonable considering the 1,400 construction jobs the project is expected to create. The message is heard loud and clear: the casino will create 5,000 jobs and put a vacant property back in to service, so what’s not to love? But take note, in this piece “Southeast Wisconsin” and “this region” almost never includes Milwaukee. Congratulations! Colleen Carpenter has been named the Milwaukee LGBT Community Center’s new Executive Director, effective November 18. And James T. Barry III, president of Cassidy Turley Barry was named the 2013 Realtor of the Year by The Commercial Association of Realtors–Wisconsin. Help Wanted! Milwaukee Public Schools is accepting applications for School Engineer I. Event. On Tuesday, November 5, 2013 starting at 6:30pm The Milwaukee Bicycle Collective will be holding the 5th Annual Winter Cycling Forum and Party for the 2013-2014 season. You’ll meet other cyclists and learn how to ride all winter long. Great Lakes Distillery will have drink specials to benefit the Milwaukee Bicycle Collective. And there will be a raffle with great prizes from: The Milwaukee Bicycle Collective, Truly Spoken Cycles, Coast In Bikes & Third Coast Inn, Becky Tesch, The Queer Zine Archive Project, Slipnot Bike Chains, Riverwest24, and Bryant’s Cocktail Lounge. I object to glass towers as some form of visual art work and they are energy hogs for heating and air conditioning. They destroy thousands of migrating birds annually. The Lake Michigan shore line is a flyway zone as birds are channeled along this path. A lighted glass tower becomes a magnet of death for them. Architects need to learn more about the natural environment around them and how to blend the building in to do the least harm. 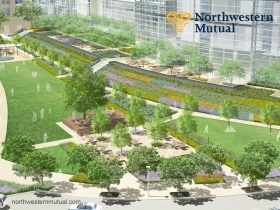 While I’m excited to see this project go forward and feel the addition of the new NML complex to downtown and the skyline will be noteworthy, I must admit I was hoping for a bit more with the expanded footprint of the public gardens. The current plaza fountain area has provided Milwaukeeans with a wonderful oasis in the heart of the city (obviously the Commons approach is the opposite of the secluded space there now). Perhaps they can work with Dan Keagan and MAM to incorporate a much-needed downtown sculpture garden in and among the trees and terraced gardens. Something unique like that would provide an alternative to the distinctive and meditative fountain area we’ll be losing. I lived in a townhouse off of S 27th from 2002 – 2006, and one day, I heard a screeching racket coming from outside. I went out and saw a bird, apparently a younger one, had fallen into a basement window well and couldn’t get out. I couldn’t figure out what to do other than go in and get my mittens, put them on, and as gently as I could, scoop the bird out and set it on the grass. It hopped/walked away, and I have no idea what happened to it after that, but holding its little life in my hand and helping it did make an impression on me. I felt terrible that the bird had suffered because of……me, essentially, because I was the one who lived there and was the person ultimately most responsible for its predicament. The number of cat killed birds stated in the article seems fairly unbelieveable, and I frankly doubt it, but the total number of birds is so high to begin with that it seems fairly inevitable that some are going to die from cats, as well I’m afraid, from smashing into buildings of various types in downtown Milwaukee. I would argue that the benefit of the building to the city outweighs the deaths of the birds that will be killed flying into it, and I would also frankly argue that the benefits of wind turbines justify their use despite the numerous birds that are killed by them, as well. All manner of creatures die each year because of the existence of humankind — my perspective is that this building at this site, while not ideal from the perspective of a bird, is not irresponsible to such a degree that it shouldn’t be built on that basis. As for the energy use in a tall glass building, Milwaukee is in a moderate climate to begin with in regard to cooling, but it certainly isn’t in regard to heating. 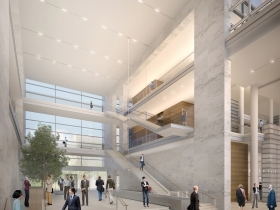 However, if the overall economics of the building make sense to Northwestern Mutual, it may very well be a wise choice on their part in regard to their business. I also think the long term economic benefit to the downtown and city is likely to be relatively enormous. I am as concerned as the next wildlife lover about the flight patterns of indigenous birds. I agree that birds will fly into the windows, and I doubt that each window will have decals that deter birds from flying into them (not that they work very well in the first place). No matter how beautiful the architects make this building, I don’t think it belongs on the lakefront. Most of the buildings on the lakefront have a lower profile, allowing for great views of the lake from the high-rise apartments that are a mile or so away from the lake. I live on the 12th floor of a building that is on Arlington and Brady, (just west of Farwell), and I can see the MAM, the harbor, and Hwy. 794. Selfishly, I am afraid that this building will block my great view, and the fireworks. There are several other high-rise apartment/condo buildings, and I’m sure many people bought condos and rented their extremely expensive homes because of the view. They must certainly be upset about losing their view. Northwestern Mutual could have certainly found a high profile, alternate location without destroying the profile of the lakefront. If I had a vote, it would be a resounding NO! Oh no, a nimby. I suppose that we should ignore the many jobs the project will bring to downtown, not to mention tax revenue, to save a paltry number of birds and a few wealthy condo owners’ views. I don’t mean to be snarky, but let’s realistically consider the advantages versus costs of the project. I think we’ll quickly come to the conclusion that we should be profusely thanking NML’s decision makers for not choosing Franklin. Seriously Dorothy? It would take a generation to fill the hole left by NML leaving to preserve your view, and in the meanwhile, Milwaukee wouldn’t be quite as nice to venture into or look at. A resounding NO vote is cutting off the nose to spite the face. Every new high rise building blocks somebody else’s view. I’m sure Dorothy-Clare Jacobs’ building (which has at least 12 stories) blocked somebody else’s view when it was built, too. That’s just the way life is in a big city. @Dorothy-you can’t be serious??!! NML should consider NOT building a beautiful contribution to our city’s skyline because its going to block some views??!!! WHAT??!! 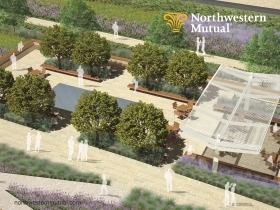 I think this is really a stunning design, and one that will serve not only its fundamental purposes of providing an exceptional working environment for NML employees for decades to come, but one that will also serve well as a symbol for NML and a symbol for Milwaukee. NML’s building is currently the project featured first on Pickard Chilton’s website. Reviewing other office projects (which include some of the most extraordinary corporate buildings constructed in the world in recent decades), the setting of NML’s building is unmatched by any other featured project. Truly an extraordinary building in a extraordinary (and unmatched) urban setting.